Running back, Jordan Roberts transferred to University of Charleston after his redshirt freshman season at West Virginia. 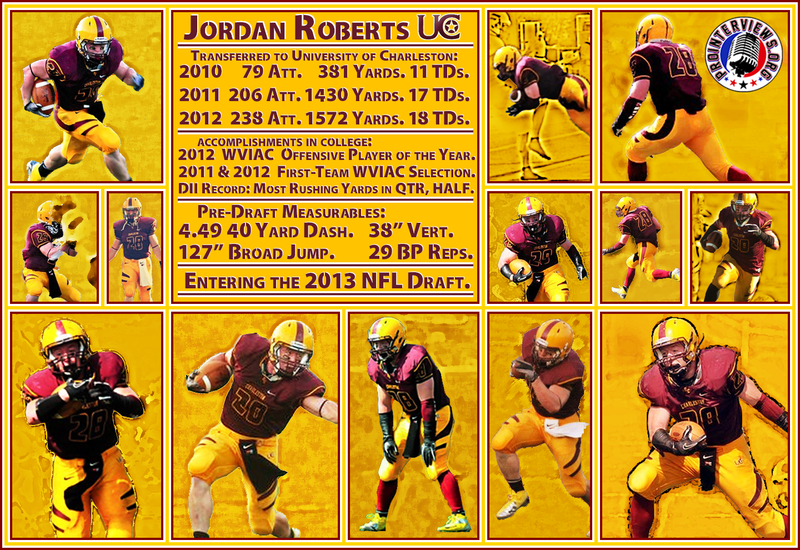 Jordan Roberts took on a leadership role immediately at Charleston, and contributed heavily in many different phases of the game. He set school records and NCAA DII records during his time playing football. He rushed for over 3000 yards and over 40 touchdowns during his time at Charleston. He is a sleeper in this 2013 NFL Draft, and may be a small school steal that a team takes a chance on. Click here to download the audio interview with Jordan Roberts or scroll down below to read it. Jordan Roberts : I want my fans to like me. Most of my fans are family, and I’m pretty close to my family so I just tell them what’s going on. When I do play, I want to put on a good show and hopefully win games and be successful. Strauss : How did you start playing football and what’s your story behind that? Roberts : I started playing football when I was nine years old. I played pop-warner little league. When I started playing actually, they didn’t use me at running back I was playing kick returner. I remember we won the championship. That year, I think I ran back like fifteen touchdowns or something like that on kick return. They also had me playing defensive end. Strauss : You ran back fifteen kick returns? Roberts : Yeah I ran back a lot of kick returns during my first year of football. I didn’t have really good hands at that time, but I remember I’d let the ball hit me. The ball would hit me and bounce off my chest, then everyone would get close to me, and I would just pick it up, and run around everyone. Strauss : Was it your decision to play football, or did family influence that? Roberts : My dad influenced me to play football. He knew I was fast at a young age. So he told me I should come out to try football. Strauss : What was Scott High school like for you? I know you have a lot of accomplishments there. Roberts : Actually in seventh grade, I transferred schools because my eighth grade year we weren’t going to have enough players come out to play football at Duval Middle School. We only had seven people come out, so I transferred schools. Then I went to Madison Middle School, and we won the championship that year and I just decided to stay in Boone County Schools. So I went to Scott High School, and we went to the playoffs every year that I was in high school, and we were a winning program. I played for a great coach, Coach Shane Griffith. During my last year in high school, we went to the third round in the playoffs, which was the farthest our school has ever been. We were beat by the eventual state champions. It was a great experience and I will never forget playing under those Friday night lights. Strauss : You played quarterback and running back? What did you really play in high school? Roberts : During my sophomore year in high school, I played receiver and cornerback. Then during my junior year, I played running back and safety. Then, when we got to the playoffs my junior year, our starting quarterback went down, so they moved me to quarterback. We ran like the wild-cat offense. Ever since then, it was really successful so during my senior year, we just kept running it and building upon the wildcat offense. I also played linebacker and free safety… I really got a chance to play everything. Strauss : The Kennedy Award… What is it like to get recognition for an award that former first round picks, Curt Warner and Randy Moss, and then you also have Quincy Wilson who was a seventh round pick, but all guys who played in the NFL. What is it like getting an honor that these guys got? Roberts : It’s a great accomplishment to be in the same class that those players are in. I hope that I can be another NFL player just like them. When I was playing football in high school, I wasn’t even focused on the award. I was focused on getting my team to a State Championship, and we just fell short of that. Honestly, I wish I had a state championship ring instead of the Kennedy Award. It is still a great accomplishment. Maybe I wish I had both, you know. It’s a great award to win. I think it reflects my hard work and dedication, and being a team player, and doing whatever it takes to win games. Strauss : You have such accomplishments in high school. What was recruiting like for you? Roberts : Recruiting out of high school… It is kind-of hard in West Virginia to get recruited. It’s not as highly recruited as a Texas or Florida. I had a few scholarship offers, but I decided to take an invite to walk-on at West Virginia. I had some academic scholarships that paid for my school. I just had a few coaches call me and tell me I could contribute there and that’s where I went. I red-shirted a year there. Then I played a year there on all of the special teams. I felt like I had a better opportunity at the University of Charleston and that’s why I transferred schools and I haven’t looked back since. Strauss : What was the most important thing you learned during your time at West Virginia? Roberts : When I was at West Virginia, I learned the importance of film study and preparation. I also learned a lot from the coaches. I was really valuable on special teams. I played kickoff, kick return, punt return, and punt block, and I just tried to do whatever I could to contribute and win games. Strauss : You decide to switch and go to the University of Charleston. What were some of the key factors that helped influence that decision? Roberts : Out of high school, not the head coach now, but the head coach right before was coach who recruited me out of high school. He came to Scott High School and visited me and offered me a full scholarship and everything. After I decided to transfer and got in contact with him, and he was real excited that I was coming to the University of Charleston. I felt like I could contribute. That’s a big reason I went. Also the University of Charleston is only thirty minutes from my house. I was close to my family, and it just made things better. Strauss : You went from being a Mountaineer to a Golden Eagle. During your first year at the University of Charleston. What was it like to switch schools and be in an environment that is completely different? Roberts : It was a big difference with the crowd and everything. We didn’t have as many fans at the University of Charleston. I felt like I had a better opportunity at the University of Charleston, and I was able to contribute. I was wanting to play right away. I wasn’t patient. The University of Charleston is a private school, so we don’t have near as many kids as West Virginia has. That’s how it’s different. I haven’t looked back, and I think I made a great decision. Strauss : What is the mindset of the team compared to being at West Virginia? Did you take anything to help teach the team and take on leadership role early on? How soon did you develop a leadership role? Roberts : I think of myself as a leader. I lead a lot by example. I work hard, and I use my work ethic to lead. I also feel like my versatility helps me feel that I can contribute in different ways. The mindset was the same way at West Virginia, as it was at UC. It’s like it is with every team. You’re just wanting to win games. At UC, we wanted to win the conference every year, and it was the same way at West Virginia. Strauss : Every year, you’re improving and got better. What is the mindset behind that every offseason training and going through that? Roberts : Well, you want to improve every year. I was wanting to be more productive as well. But I was really just focused on, this past season, I just wanted to make the playoffs. I rushed for a lot of yards and everything, but I just did that to win games and help out in as many ways as I could. I played on offense and special teams and just tried whatever I could to contribute to the success of the team. I feel like at the next level I can do that as well. Just contribute to the success of the team, and do whatever it takes to help the team win, and hopefully, get the right opportunity and win games, and hopefully win some Super Bowls. Strauss : At Charleston, Do you have a favorite touchdown from your time there? Roberts : Not in particular, but I liked my kickoff return against UNC Pembroke. I think it was a 100-yard kickoff return touchdown. That touchdown actually helped us upset UNC Pembroke. They were actually ranked nationally at the time, and I felt like that kickoff return helped my team win that game and shifted the momentum. I think I threw a touchdown in that game too. That was my only college touchdown I threw. I threw a two-point conversion in the regular season, but those are probably my two favorite touchdowns, just because they helped us upset one of the nationally ranked teams in the country. Strauss : You’re a contributor on special teams and as a running back. Not many running backs, especially at the D1 level I would say do both. How has that bettered you as an overall athlete? Roberts : I think it’s helped as an overall athlete because of my versatility. The University of Charleston this past season used me at running back, kickoff returner, wildcat quarterback, and sometimes they would flex me out in the slot. I was on punt block. I blocked a bunch of punts this season. I was just worried about doing whatever it took to win games. That’s how I feel I can do it at the next level. Just be used in a lot of different ways. And hopefully that helps the team win games. Strauss : Is there something you look back at that you would say is your most prideful individual accomplishment? Roberts : I would say my most favorite individual accomplishment would be in my last game as a Golden Eagle, when we played West Virginia State. We were 8-2 at the time, and we won the game and went to 9-2. I only played one half of football. I played one series after halftime, and also because my coaches didn’t want me to get hurt. Because at that time we thought we were going to make the playoffs. You know with a 9-2 record. So they took me out of the game. But at the time, in a half, I had two NCAA records. I had most rushing yards in a quarter (190) and the most rushing yards in a half (273), and those two NCAA records. I also had five touchdowns too. And that’s probably my best individual accomplishment. Strauss : Do you have a favorite memory with your team? Roberts : My favorite memory with my team was during my junior season when we upset West Virginia Wesleyan and they were undefeated. They were 9-0 at the time. We played them at home and we knocked them off, and that was one of my most memorable moments as a junior. Then during my senior season, we had a great season. We went 9-2, and I just felt like the whole season was memorable and something that I’ll never forget for the rest of my life. I wish we would have made playoffs. That was our number one goal, and I felt like we should have made it. Strauss : Being at a small school, you don’t get to have a pro day. But you did go to Fairmont Sate Pro Day, and a regional combine? Roberts : Yeah, and I also got invited to the Super Regional Combine. I just participated in that about a week ago. Strauss : What has this whole process been like for you? Roberts : This has been a great process. I had a great Pro Day. I had a great regional and super regional combine. I felt like I’m doing whatever it takes to get myself out there to NFL teams. You just have to make to most out of every opportunity that you get. I felt like I’ve taken full advantage of it, and I’m ready for the opportunity. Strauss : With the draft coming up, how do you feel about the draft and about your situation? How would you describe it? Roberts : I feel like a chip on my shoulder. I’m just going to do whatever it takes to be the best player that I can be and contribute to a team and be successful. I’m a team player first. And I’m going to do whatever it takes to help a team out at the next level with my work ethic, and try to help a team win some Super Bowls. Roberts : One of my favorite NFL players is Marshall Faulk. He doesn’t play right now but he’s my all-time favorite running back. I feel like I compare to him, we both have the same number 28. I feel like I compare to him in my versatility. As far as he was a great running back and they won Super Bowls. He’s one of the greatest running backs to ever play the game. They used him in a multitude of ways. They flanked him out as a receiver. He could catch the ball in the backfield. I feel like I got great hands and I feel like I can catch the ball in the backfield as well. I don’t know if they used him as a kick returner, but I feel I can be used as a kick returner, and I blocked four punts this past season. Two at University of Charleston, and then I played in the Aztec Bowl and I blocked two other punts. And I ran a kickoff back. So I feel like I’m a versatile player who can contribute to an overall success of the team. Strauss : If a team were to call you up in the seventh round towards the end and say, “We have this pick, were willing to take a reach on you. Give us your sales pitch on why we should use our pick to draft you?” What’s your best answer for that? Roberts : I think my best answer for a team that’s going to draft me is… I’m going to be a versatile player that you can use in a multitude of ways. I’m going to find a way to contribute to your team. You’re not going to have any off the field problems with me I’ve never had drug problems or anything like that so. I’m going to be a professional. I’m going to behave as a professional. I’m going to be a guy that you can depend on, to help contribute to the team. Then, hopefully we will get your team where you want your team to go. Strauss : Is your dream to play professional football? What does your future entail in your mind? Roberts : My future hopefully is professional football. If it’s not, hopefully, I’m trying to make that 53 man roster, but if that doesn’t work out hopefully I am on the practice squad. Just doing whatever I can to contribute and help the team out. Hopefully, I can just move my way up and contribute to the team. I am going to do whatever it takes to compete at the next level and be successful, and if I don’t make it on an NFL team, then I’m going to do whatever it takes to be a professional and play at the next level, and be successful and win games. Roberts : One of my favorite quotes is… “There’s no tomorrow”. That was one of our high school quotes. I think it’s off one of the Rocky movies. I think you should prepare and work every day and act like each day like there’s not a tomorrow promised. Every day you should live like it’s your last. Strauss : Taking that mindset to the way you have been training recently for the NFL. What’s your training process been like and your workouts? What has the process been like the last few months? Roberts : At first, after football season, I was training back at my high school just doing workouts on my own with a few people there. Recently, after my regional combine I got with some guys in South Charleston. And it’s just like thirty minutes from my house at A-Game Performance with a guy named Derek Raynes and Eric Gerencir. They’ve helped me work on my technique, and enhanced my performance. They’ve improved my times and everything. I am working out there now. They train with a lot of different athletes. I think they use to train at the DiFranco’s Gym that works with some NFL guys. They know everything to do to improve my athleticism, technique, and everything like that. It’s just been a great experience working with them and learning things that I didn’t know anything about. Strauss : I ask this to plenty of NFL players so I’m not leaving you out. If you could describe yourself as any ice cream flavor, what would you be and why? Roberts : (Laughs) Well yesterday, I went to Chick-Fil-A and I had a milkshake there and it was cookies and cream. I really like that flavor of ice cream, I thought it was great and everything. I’d probably compare myself to that flavor just because I want to be a likable guy. I like cookies and cream a lot, so hopefully I can be a likable guy. I want to help my team out and be dependable because I feel like that’s a dependable ice cream flavor because I’m sure a lot of people like it and depend on it to satisfy their cravings. Strauss : I appreciate it. Thank you for sharing your story with me. Roberts : Thank you. You did a great job interviewing me. And just thanks for the opportunity. Announcement : Thank you for listening to the interview with Jordan Roberts. Please check out www.prointerviews.org for more interviews, “LIKE” our Facebook page at www.facebook.com/ProInterviews, and follow us on twitter at www.twitter.com/ProInterviews. Make sure to connect with us to stay updated for more interviews.